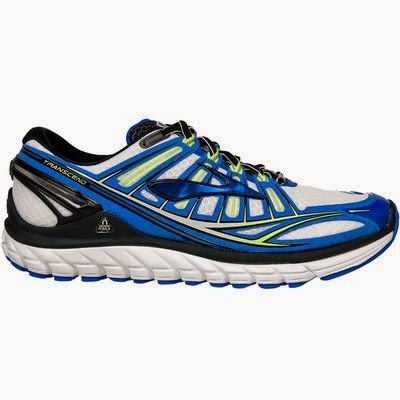 As I've said before, the Brooks Adrenaline GTS 14 (REVIEW) is one of my favorite training shoes thus far. When the Transcend came out, I was curious regarding an 8mm drop, variable support shoe. The guide rail system was something I was interested in, especially the fact that it covered both the medial and lateral sides of the shoe. Most shoes will only provide support for pronation based motions. The guide rail system had the potential to provide support all around the foot, including that for supinating feet. So, after my 3rd pair of Adrenaline 14s started wearing out, I decided to give the Transcend a try. Below are my thoughts. Sole: Brooks did a great job with this sole design. It's has full ground contact, a curved heel that gives it a nice transition (Brooks calls this the "Ideal Heel) and a straight lasted wide base. This gives the shoe a nice stable base to start with. 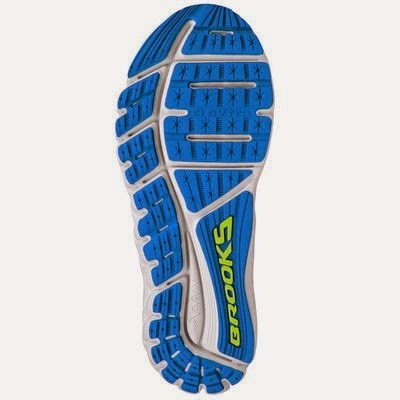 The midsole is a combination of cushy and firm. I would not call this a Hoka-esque shoe. It seems to have a nice balance of cushioning, although does fall on the softer side of things. This sole has so much potential. The so-called "Guide Rails" on both the lateral and medial side of the shoe do provide some kind of support, but nowhere near as much as the Adrenaline or Trance (the Trance was the shoe the Transcend took over for. A high cushion high stability shoe). I would actually classify it more as a mild to moderate stability shoe and not a high one. Why? Because while I said this isn't the softest shoe, a soft midsole does make a shoe slightly unstable. So I think the high cushion combined with support ends up somewhere in the middle. I did not feel near as much support as the Adrenaline, which is actually fine for many people. The support does seem to come and go a bit as I have felt it a bit more on days I am more tired. On other days I don't really feel it at all. So actually I kind of felt the Guide Rails were underwhelming because I didn't really notice them. Maybe that's a good thing? However I have seen a few neutral customers wearing this shoe without complaint and upon analyzing their gait didn't notice any abnormalities. So theoretically this shoe could work for a wide variety of people. Upper/Fit: Here is where I had all my problems which killed the shoe for me. The upper is not up to pare with the sole. The first major issue I have is how significantly the upper tapers in the forefoot. This is a fairly pointed shoe in the toebox and I was extremely disappointed with the fit. When you look at the shoe from the top, the pointiness is noticeable, although I had hoped the fit in the interior would be different. It wasn't. I then had hoped it would break in, but after several months it still has not. That leads to my next issue: upper thickness. It's really thick. I can understand this is part of the all around plush feel Brooks was going for, but it ends up being overbearing and heavy. The upper also does not seem to move with the foot that well as I continually had issues with the fabric over the toes crinkling and hitting the top of my foot with most steps. Luckily I have not noticed this while running. The other issue is that the heel is a bit wide, so definitely make sure you lace lock these shoes or you may experience some heel slippage. Not as big as the first problems I had, but definitely noticeable. Responsiveness: The Transcend is an 11.8 ounce softish shoe. Responsiveness is not what this shoe was designed for. It has a protective and comforting ride, but is not quick. 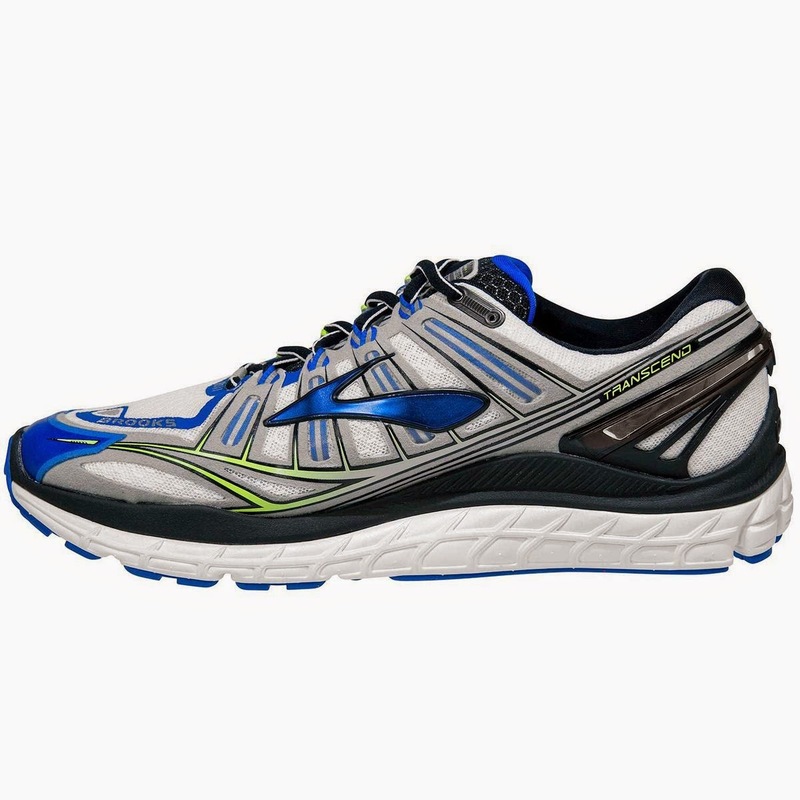 My feet don't sink into the shoe and as I mentioned early the sole is not Hoka-esque, but the weight definitely pulls down any responsiveness. Heel-Toe Drop/Ramp: The Transcend definitely feels like a 7-8mm drop shoe as it is advertised. Lower than the Adrenaline 14 but higher than the Purecadence 3 (REVIEW). Additional variability is probably added by the softer midsole which will compression with footstrike, so it may vary between individuals. Durability: Here's another thing Brooks did well with on the sole. It's really durable. After 100 miles I am seeing next to no wear at all. That's including using this as a casual shoe. So I am very impressed with the HBR plus used. Weight: This shoe is heavy. At 11.8 ounces on paper it will seem to be a clunker. On the road it's not as bad, but the Transcend is still a heavy shoe. Definitely one I have kept for recovery days or walking around casually. Thoughts as a PT (Student): First off I'm still very unhappy about that toebox. I have said over and over how shoes with a pointed area in the front can cause many issues. These include bunions (although calf tightness and foot compensation are more a factor, but the toebox helps facilitate their formation), neuromas (neuro tissue in the foot gets compressed because of how cramped the toe box is) and more. I cannot tell you the number of patients and customers I have seen with foot deformities caused by wearing pointed shoes. I know Brooks is better than this which is why I was so surprised and disappointed. Hopefully they will fix this in the next version. Now about the guide rail system. I like the idea. Not sure if it completely works, but I appreciate what Brooks is trying to do. This shoe seems to work for a variety of people, so maybe it does work. I'm still undecided. I like the idea of support being used to keep people from doing too much of one motion rather than forcing them to do another. Brooks has already come a long way in terms of how they do support with their diagonal roll bar posting system (DRB) in their support shoes. This has different densities of materials on the medial side that slows down how fast your pronate, rather than completely stopping you from doing so. That kind of system I like better for the general public (people with significant foot deformities should seek a professional podiatrist, physical therapist or orthotist if more is needed) as it tries to facilitate motion rather than forcing it. Final Thoughts: Brooks has a ton of potential with the Transcend. All they need to do is fix all the issues with the upper and that toebox fit and they'll have a pretty awesome training shoe. I really appreciate how they are trying new things out in regards to the guide rail system and look forward to what else comes out of their research labs. I have to be honest that I stopped the second I got to 100 miles in this shoe as the upper/toebox was killing me, but the second that gets fixed I'll be back to try this shoe again. I really like the full ground contact outsole (and how durable it is), the ideal heel, 8mm drop and balanced softness of the sole. The Transcend 2 should be out in the next few months so I'm keeping my fingers crossed that the upper issues were fixed. So who would I recommend this shoe for? Someone who wants a softish and very protective shoe with mild-moderate support needs who is curious about a slightly lower heel drop. Try on a half size larger to see if that takes care of the pointed toebox, or if you are used to wearing shoes like that, you may not notice. Either way, give them a try on to see what you think! These shoes were a personal purchase and I put at least 100 miles on every pair of trainers and 50 miles on every pair of racing flats before I review them. Currently I have 100 miles on my pair. As always, my views are my own. 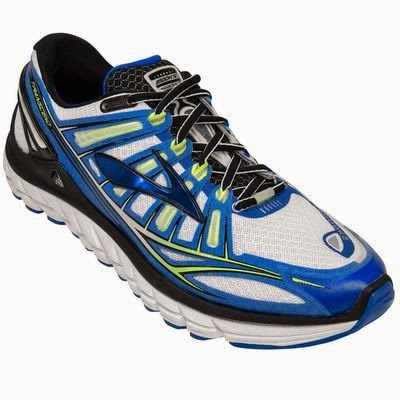 *Images obtained from the Brooks Running website. Go down to your local running specialty retailer to check them out!